Bruno Jorge Soares is the manager of the Industry 4.0 project at ABDI. 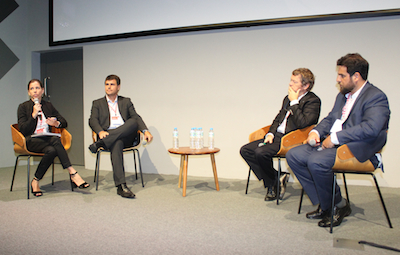 The event took place on Campus Google in São Paulo on November 27, 2018, and was organized by Innovation Norway, The Brazilian Agency for Industrial Development (ABDI) and the Norwegian Embassy in Brazil. It was the third edition of the event, which has become a platform for discussions where different players get together to showcase relevant topics. Essential to industrial development today is the internet of things and Industry 4.0, also known as the 4th industrial revolution. Industry 4.0 is a name given to the current trend of automation and data exchange in manufacturing technologies. Keynote speaker was Bruno Jorge Soares, manager of the Industry 4.0 project at ABDI. 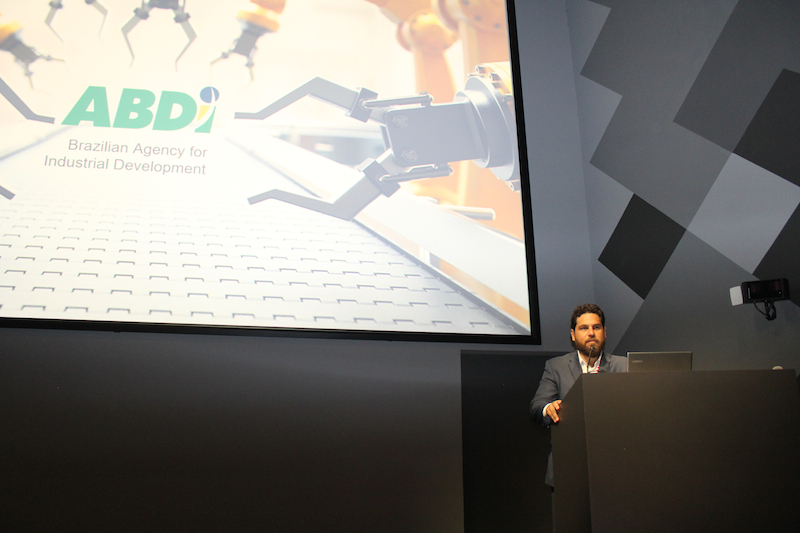 In March 2018, the agency launched their Industry 4.0 agenda, and Mr. Soares listed the main initiatives to the seminar. Numbers show that gains from the so-called 4th industrial revolution are huge. According to Mr. Soares, the potential reduction in manufacturing costs is of USD 21 billions and efficiency gains would be in the range of USD 10 billion. Huge gains are also expected within energy and maintenance. «The main tracks we work along are increasing knowledge and promoting the use and development of technology through demonstration plants and test beds. Currently we have 10 such test beds in Brazil. We also work to connect corporations and their challenges with start-up solutions and we work to strengthen international partnerships», Mr. Soares said. 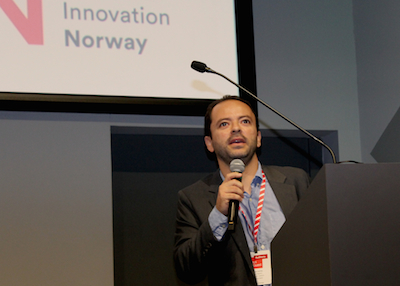 In the following presentation, Alisson Nogueira from Kongsberg Digital talked about the «Kongsberg digital ecosystem». Kongsberg Digital has four divisions working on maritime simulations, oil and gas software and services, renewables and utilities and the digital platform called Kognifai. Alisson Nogueira of Kongsberg Digital. Mr. Nogueira also outlined some Norwegian initiatives and emphasized the technological willingness in the Norwegian population and the well developed ICT infrastructure as an advantage. The Digital Norway initiative is a community to accelerate digitalization of business in Norway. Digital 21 is another initiative created by the authorities that has defined 64 measures that will lift Norwegian industry´s ability to develop and apply new technology. He also presented cases, like the autonomous, zero-emission ship Yara Birkeland and Kongsberg´s digital twin project with Equinor as partner. José Nagib Cotrim Arabe from the Department of Computer Science at the Federal University of Minas Gerais gave a presentation called «Mechanisms of cooperation between industry and university».where he outlined relevant laws and regulations and the role that development and funding agencies play. He talked about the experience that his department has with companies within IT, energy, services and oil and gas, with over USD 20 million in active research grants. The department also houses a unit of EMBRAPII, The Brazliian agency for industrial research and innovation, with software for cyberphysical systems as the main competence area and with federal funding of research. From the left; Sonja Hauge, Alisson Nogueira, Stephanie Stolfo, Gro Dyreng and moderator Pilar Neves. Norway Tech day 2018 also featured a session on gender. The panel «Technology is genderless» addressed the gap between men and women in the workforce in the tech sector. In Norway women represent 33 percent, while in Brazil, the share is only 20 percent. 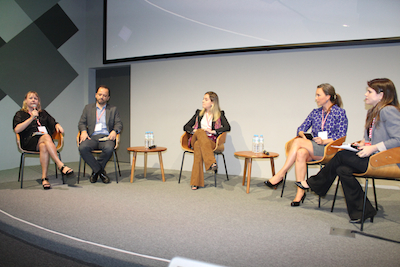 Panelists were Sonja Hauge from Aker Solutions, Alisson Nogueira from Kongsberg Digital, Stephanie Stolfo from IBM Brasil and Gro Eirin Dyrnes from Innovation Norway. «Diversity is important and I believe that this is high on the agenda in most bigger companies. But society as a whole also plays a role here, parents play a role. There are only 19 percent women studying engineering in Norway, and the question is how we can increase the recruitment of female students», Sonja Hauge of Aker Solutions said. Stephanie Stolfo from IBM believes increasing diversity is not only a human resources issue, and that diversity contributes to increasing women´s motivation, because they need to feel that they belong. All the women on the panel shared personal experiences and episodes from their professional life where they were discredited because of their gender. «It is not a good idea to be humble, and for me personally, it has made me stronger», Ms. Hauge said. Go Dyrnes encouraged women tot use such situations as stimulation, and not provocation. Ms. Stolfo said it is empowering to women to share stories and let colleagues know if they are being disrespectful. In the session on production, Clarisse Rodrigues from silicon based material manufacturer Elkem shared her company´s experiences on the Industry 4.0 concept, and how Elkem is implementing 4.0 actions. From the left; Clarisse Rodrigues, Carlos Boechat, Lieven Cooreman and moderator Bruno Soares during panel on production. Lieven Cooreman from fertilizer company Yara Brasil said that the industry still needs to be humble in these revolutionary times. Carlos Eduardo Boechat from Cast Group recommends all companies to create their own roadmap towards Industry 4.0. «What we seek is improved productivity and efficiency, and this is something that Brazil needs», he said. The last session was dedicated to the topic of logistics. and presented IoT technologies already applied to the logistics sector, solutions under development and how the sector s taking logistics to a smarter level. Panelists were Alexandre Araujo from BastianSolutions, Gerson Rolim from Vecto Mobile and Luiz Renato Martins Costa from GS1. According to Alexandre Araujo, transparency, traceability and information is key to clients when it comes to logistics, and the use of sensors and trackers attached to assets in transit was one example of IoT solutions that Bastian Solutions has developed. Luiz Costa GS1 focused on the need for open standards, to enable communication between different systems. Gerson Rolim presented solutions for vehicle tracking that his company has developed. Norway´s Ambassador Nils Martin Gunneng. 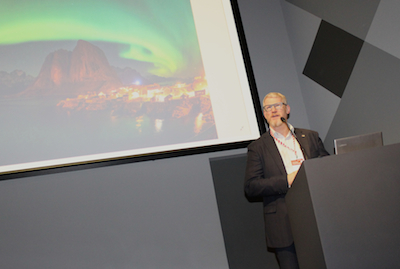 Norway´s ambassador Nils Martin Gunneng was also present at the third edition of Norway Tech Day in Sao Paulo. «Norwegian companies such as Yara, Aker Solutions, Elkem, Hydro, Kongsberg and Equinor produce in Brazil and invest locally in topnotch technology for production. We consider Norway to be a strong partner to Brazil. In Norway, the industrial share of value added is gong down, and automation and digitalization are important ways of improving productivity. We need to do this, and this is the challenge we bring to you today, to bring us together into the future», Norway´s ambassador said in his address to the event.